The new style Cybermen that appear here are entirely my own design and use two cheap female figures as their base. The figures were a kind of bootleg Spawn figure that I picked up many years ago. These Cybermen were made in early 2005 long before the new series Cybermen had been unveiled. Had I seen the new series Cybermen first, this story would almost certainly have featured them. My Rose figure was modified before this story was shot. The cloth hair (seen in The Unearthed Enemy) just didn't feel right. When she appeared in The Long Game with her hair up, I knew that look would allow the Rose figure to move her neck, so that's the look the figure adopted. The Tico missile is from a Star Wars Y Wing Fighter. The Cyber spaceships are paper models. 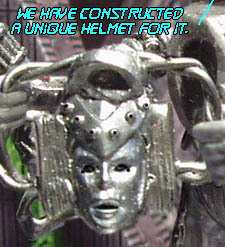 The Mk6 Cybermen used the basic 'clone' body that most figures up to that point had used. The Cyber head was made in Sculpy, a mold made and then three heads were cast in resin. The chest units were made individually out of sculpy. The story was originally posted in May and June 2006. In keeping with the TV series, the episodes had different titles with part two being Remember Me. This practice has been dropped for the reprints. It was accompanied by a superb cover by Luke Spillaine after two abortive attempts from me. At the time it was posted, the Cybermen were appearing on the TV series. The script was not altered to reflect what occurred on TV. Any similarities- such as the cyber-comversion process being referred to as an "upgrade" are purely coincidental. Honest. The Series that didn't happen. Was completed and posted on the day the new series debuted. The Doctor and Rose accidentally bring an alien Skraath to London 1613, meet Sir Henry Wotton and are responsible for burning down the Globe Theatre. 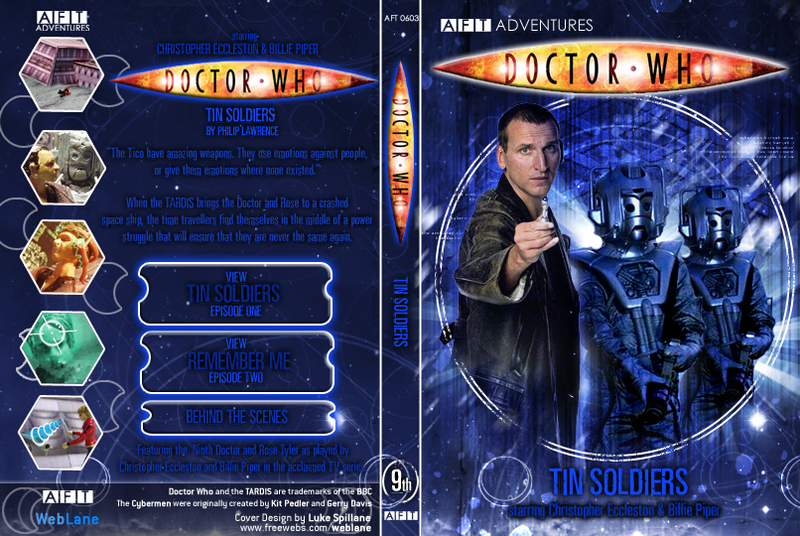 Reworked and produced as a 10th Doctor story. A deserted tube station at night, the Doctor and Rose meet the deadly Nightshade. Picking up and expanding on the monsters introduced in The Infinity Program. Most of the stories were well developed. Sets were even made for All Is True and Axis. It's possible that these stories will be made in the future. 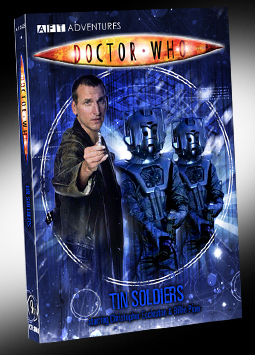 Tin Soldiers was written in the run up to the show's return to our screens in 2005 as part of a six story AFT season beginning with The Unearthed Enemy. We knew the Daleks were back so the next logical big bad for the Doctor to meet was the Cybermen- at the time it was written (early 2005) there was no mention of the Cybermen returning to the TV series. Conscious that they would return one day the story is given a cop out at the end with Rose's convenient loss of memory. The story was shot in late 2005, back to back with Earthshock! Return of the Cybermen and The Doctor vs Alien. This is one of the first stories to use individual pictures for each frame, rather than the whole page in one. This allows for mouseover frames as with the revelation of the new Cybermen at the end of part one. What? You missed that? Go back and have a look. Mouseover frames have a red border. This story takes place after The Long Game, as Rose mentions the last thing she remembers was saying goodbye to Adam. Rose's memory loss means that she doesn't remember this story when she meets the alternate universe Cybermen. It also accounts for the reason there is no sign of 'Bad Wolf' as future Rose doesn't remember the adventure, she doesn't think to send a Bad Wolf message here.